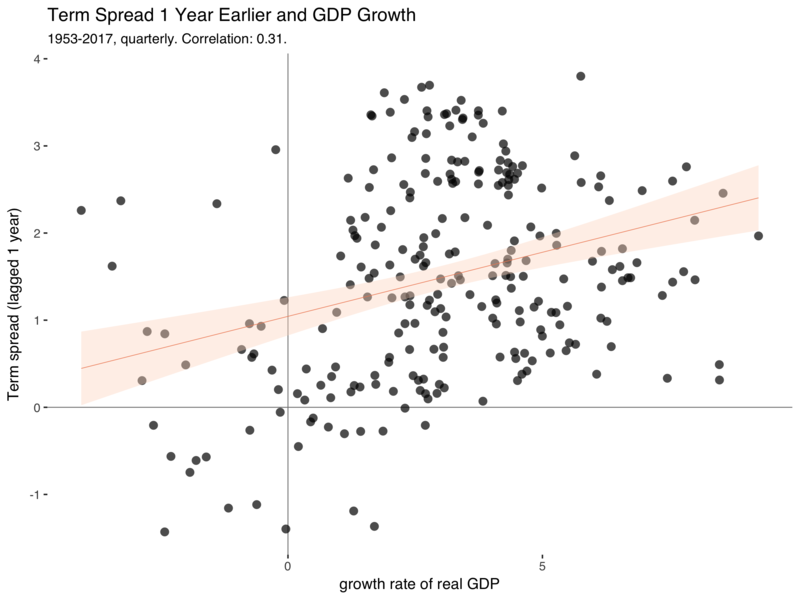 This is the first part of a series of posts on term spreads and business cycles. There'll probably be three parts. The term spread is the return differential between a long-term and a short-term safe bond. We can use this to learn about how market participants expect the economy to perform over the next year or so. My explanation loosely follows Stephen Cecchetti and Kermit Schoenholtz’s book “Money, Banking, and Financial Markets”. So long-term interest rates are composed of expectations about future short term interest rates. Combine this with what the Cecchetti and Schoenholtz call the Liquidity Premium Theory. Returns that accrue farther into the future are more risky, as the bond issuer may be bankrupt and we don’t know what inflation will be. This means that rates on bonds with longer maturities are usually higher. As is higher for greater , interest rates will tend to be higher for longer maturities. A positive term spread can mean two things. Either we expect the average future short-term interest rate to rise or the difference between the two risk premia () has increased. We would expect this difference to be positive anyway, but it might widen even more when inflation becomes more uncertain or debt becomes riskier. But disentangling the two explanations is difficult. It’s more interesting when the term spread turns negative. The difference between the risk premia probably stays positive, so investors expect short-term interest rates to decrease. Short-term interest rates are mostly under the control of the central bank, so this probably means that people expect monetary policy to loosen and that the central bank lends more liberally to banks. And why would the central bank do that? That’s usually to avert a looming recession and buffer negative shocks. Given that the central bank also responds to changes in the economic environment, it’s not clear what’s causing what here. But either way, when term spreads turn negative, investors expect bad things. This is why the term spread tells us something about investors’ expectations. This is exactly the relationship that makes people think of term spreads as a good predictor of GDP in the near future. […] [I]nformation on the term structure – particularly the slope of the yield curve – helps us to forecast general economic conditions. Recall that according to the expectations hypothesis, long-term interest rates contain information about expected future short-term interest rates. And according to the liquidity premium theory, the yield curve usually slopes upward. The key statement is usually. On rare occasions, short-term interest rates exceed long-term yields. When they do, the term stucture is said to be inverted, and the yield curve slopes downward. […] Because the yield curve slopes upward even when short-term yields are expected to remain constant – it’s the average of expected future short-term interest rates plus a risk premium – an inverted yield curve signals an expected fall in short-term interest rates. […] When the yield curve slopes downward, it indicates that [monetary] policy is tight because policymakers are attempting to slow economic growth and inflation. We still don’t know what’s causing what. Is the central bank the driver of business cycles or is it just responding to a change in the economic environment? Stay tuned for the next installment in this series in which I’ll look at the role of monetary policy.